Auditory illusions have piqued the interest of the scientific and music communities, essentially since the second half of the 20th century. By definition, an illusion refers to the misinterpretation of an objective reality. More generally, this term yet describes a wide array of strange and deceptive sound phenomena, which are not necessarily illusory as they do not systematically show a disjunction between what should be “normally” perceived and what is “actually” perceived. 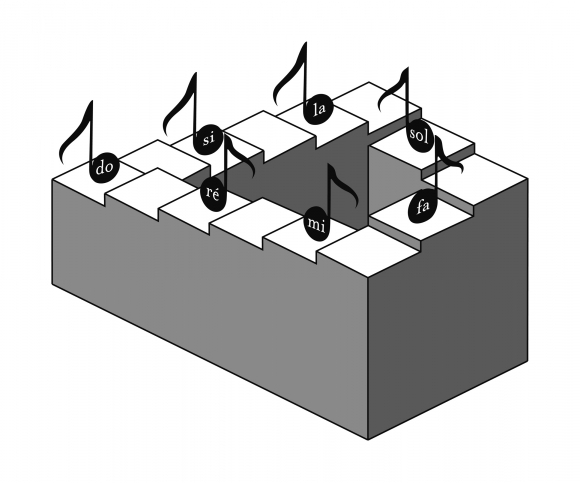 This article aims to better define the auditory illusion. To do so, we will provide a brief historical overview of the research in this field, with special emphasis on the formalisation and categorisation of these illusions by certain scientists. We will then describe our own typology, which strives to encompass all sound phenomena of an unusual nature. Amongst these are auditory illusions and paradoxes, which we will illustrate through musical examples taken from Jean-Claude Risset’s works. Perhaps the most fascinating thing about this kind of one-note music is not the little changes which the composer causes in the sound, but the additional ones which somehow seem to happen in one’s ear. Sometimes I found it hard [sic] to focus on some aspect of the sound which I knew, simply by the logic of what was going on, was acoustically present. Sometimes it was hard to tell if one thing was getting softer or if another thing was getting louder. Sometimes one of the overtones would change its color and it would sound like everything else was changing too. And often I could tell that something was changing, but would not be able to hear exactly what it was. Of course, it could be that as my ears become more accustomed to hearing music like this they will stop playing these weird tricks on me. But I have the feeling that illusions of this nature will always be created when pure electronic tones are sustained in a context of this nature. We know quite a bit about optical illusions, but I have never heard the term “aural illusions.” For some reason no one seems very interested in these phenomena, but they certainly exist, at least in electronic pieces like this one. Maybe someday there will be a musical equivalent of Josef Albers, who will work out a theory to explain how they happen. In the meantime, we can just listen and be pleasantly mystified. 1As noted by Johnson, auditory illusions are not as widespread and well-known as optical ones. Nowadays, they still suffer from a certain form of ignorance, although they have been scientifically studied since the 1950s and increasingly examined from a musical perspective. About Rhys Chatham’s Narcissus Descending, Johnson refers to auditory illusion, because this music “plays tricks” and invites listeners to be “pleasantly fooled.” Can we really talk about auditory illusion in this precise case? This expression has several meanings and is often used to refer to a whole range of sound phenomena that are more or less enigmatic and mystifying, though not necessarily illusory in the strict sense of the word. This is the reason why we are interested in reflecting on the development of a typology that would cover all unusual sound phenomena, to ultimately better define what would really fall within illusion (among others), but also paradox. 3The objective is not to offer an exhaustive list of these unusual phenomena, but rather to explain the basic principles of our typology. We will then further examine illusion and paradox, two effects that we shall illustrate through music examples taken from master-illusionist Jean-Claude Risset. 7 Diana Deutsch, “An auditory illusion,” Nature, no. 251, 1974, p. 307-309. 5Therefore, illusion reflects discord, insofar as it does not relate to any objective reality. But what is this “objective” reality, exactly? Shall we refer only to the physical properties of the acoustic signal or also take the properties of auditory perception into account? Everything would be an illusion, if we should not take the psychoacoustic reality into account, i.e. “the set of strict and highly formalized experimental paradigms which aim to establish a quantitative link between the parameters of the acoustic world and those of the listening experience.”12 Besides, as Wessel and Risset explained, one must not reduce illusions to misinterpretations; they should instead be considered with Purkinje’s famous phrase in mind as, “a deception of the senses, truths of perception.”13 In addition to the idea of a certain discordance with reality, of disjunction between what should “normally” be perceived and what is “really” perceived, illusion also refers to an “appearance void of reality.”14 For instance, the sound reproduction techniques allow to create the illusion of a presence, by having us believe that a certain source is physically present, while the sound signal has “no visual compensation or vibratory causality.”15 Therefore, defining illusion is not simple, though the notion of deception is a constant. Let us briefly get back to how auditory illusions used to be listed, in order to appreciate their polysemic nature. 6In their groundbreaking article, Wessel and Risset describe several types of illusion, gathered into six categories. The auditory system is able to reproduce the missing parts of a sound signal when these parts are compensated for by noisy signals. A monodic series of notes may be perceived as an entanglement of multiple melodic lines, because of the formation of auditory streams. The sensation of pitch cannot be limited to the frequency of the acoustic signal, since it actually depends on two characteristics that vary concurrently: the pitch class, or, in other words the circular representation of the notes within an octave; and the pitch, height that extends along a one-dimensional continuum from high to low, which is, in case of a sound with partials, the qualitative sensation correlated with the range of the most intense spectral components. By dissociating them, it is possible to create sounds that endlessly ascend (or descend), but also sounds that simultaneously ascend and descend. In the continuation of the previous effects, it is possible to produce beats that seem to endlessly speed up (or slow down), as well as paradoxical beats, which for instance speed up to eventually result in a slower beat. Depending on the context, the same sound structure may be interpreted differently, in the same way as Necker’s reversible cube, the front and rear sides of which can be reversed. In some cases, the brain is subject to confusions and illusions related to the localization and movement of sounds. One gets the impression that a sound is produced at a certain place, although there is no acoustic source there. 17 John Pierce, The Science of musical sound, San Francisco, W. H. Freeman and Company, 1983. 19 Jacques Ninio, La Science des illusions, Paris, Odile Jacob, 1998. 13Wessel and Risset list and describe a certain number of illusory effects and classify them, either according to the procedures of perception, or according to the sound or musical parameters in play. Some of these effects reveal natural mechanisms of auditory perception and are perfectly well-rooted in our listening habits; while others are artificially constructed and present themselves as impossible sound “objects.” The term “illusion” encompasses here a wide array of phenomena, most of which are described in John Pierce’s The Science of Musical Sound17 (backed by numerous sound examples), as well as in another article by Risset.18 In his book La Science des illusions,19 Biologist Jacques Ninio lays the foundations for a classification method, drawing inspiration from Richard Gregory’s researches, who is a leading expert in optical illusions. Ninio proposes to classify visual and auditory illusions in accordance to the great procedures of perception (perceptive thresholds, contrasts, segregations/fusions, completion, adaptation, consistencies, points of reference/localizations, arbitration) rather than in compliance with the parameters that are prone to misinterpretations. The typology we have developed draws on these investigations, while striving to encompass every sound phenomenon that could be considered, in one way or another, as unusual. 20 Jacques Ninio, La Science des illusions, Paris, Odile Jacob, 1998, p. 13. 14How can we determine whether a phenomenon is unusual or not? What would be the definition of an unusual phenomenon? By definition, what is unusual arouses astonishment and surprise through its out of the ordinary nature, which goes against custom and rules. However, each one has their own knowledge and points of reference, so that what is unusual to one may not be to the other. Besides, what used to be unusual in the past may not be today. As Ninio notes: “We used to believe, on the basis of the information collected by our sensory organs, that things were that way, while culture and reason have made us aware that they are different.”20 In this way, the phenomena regarded as illusory by Lucretius (echo, reflection in a mirror...) are now included in the legitimate representations of reality. The typology that we aim to develop shall remain open, so that every phenomenon that seems or would seem somewhat unusual might be included. We are fully aware of the utterly subjective nature of such a premise, but it allows us to lay the foundations for a generic classification method that would include a great variety of known phenomena, but also ones that are yet unknown. The changes that occur in the ear, to which Johnson refers when dealing with Chatham’s music, are not necessarily illusions. Nonetheless they reflect remarkable sound specificities (such as differential sounds, beat phenomena, resonance phenomena) intentionally emphasized by the compositor who wishes to surprise the listeners, and offer them a singular experience. These phenomena cannot be mistaken with illusions, since they do not reveal misinterpretations. However, we must find a way to include them in our typology. In order to better understand the development of this typology, let us take a concrete example: overtone singing, a truly unusual sound phenomenon which may be a source of illusions to the novice’s ear. 15Overtone singing is an ancestral practice that consists in applying a filter on one’s voice by using one’s pharyngo-oral cavity as a variable-volume sound box, so as to produce a melody made of harmonics. This practice, deeply rooted in the Mongolian culture, is often a source of amazement for western listeners, who can hardly believe that a single singer can simultaneously produce several tones. 16Is this dual-tone voice illusory? Is there really a misinterpretation? 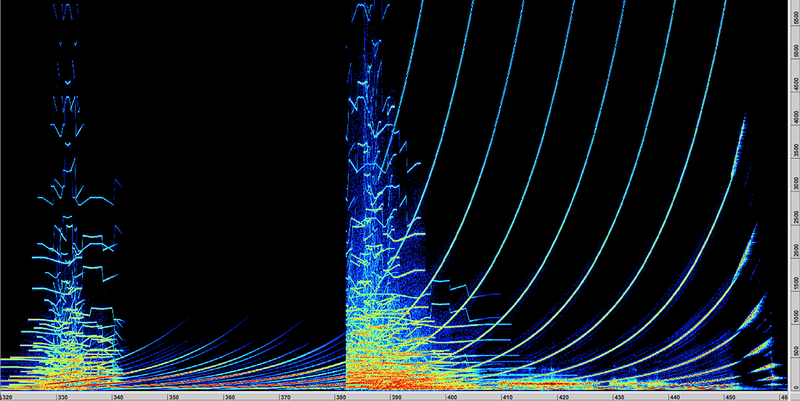 The spectrogram (fig. 1) shows that the sound is made up of many harmonically related frequency components (they appear as equally spaced); the fundamental frequency (the first component) is situated around 165 Hz. It also recounts the impressive filtering operated by the singer: the first components, including the fundamental, are not very intense, as opposed to those comprised between 3.000 and 3.500 Hz, which makes the sound almost strident at times. 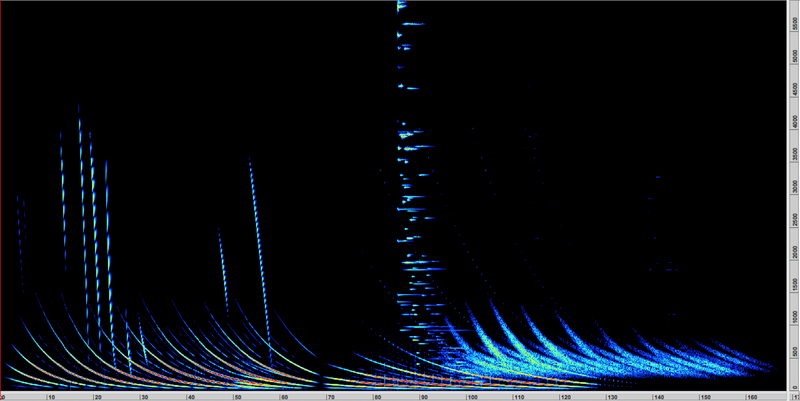 However, the most striking feature is the enrichment of harmonics 7 to 12, which produces a strange-sounding melody. This example clearly shows that, in the case of a harmonic signal, the pitch cannot only be correlated to the fundamental frequency, which is here fixed around 165 Hz. On the contrary, the pitch undergoes constant changes, so that harmonics can stand out from the sound structure to become a distinct auditory stream. While it is indeed an unusual effect, in no way can it be associated with an auditory illusion. On the other hand, an inexperienced listener may doubt that the source of this sound is only vocal, and especially the fact that it is produced by a sole musician. As such, there is a misinterpretation, but it concerns the identity and number of sources, rather than the sound itself. How can we distinguish and list all the various unusual phenomena that come into play in this particular example? 1) The acoustic phenomena—of a physical nature—concern the fundamental properties of acoustic waves and are explained by the laws of physics. The Doppler effect, echo, reverberation, mirages and acoustic channels, whispering galleries, etc., all fall within this category. 2) The auditory phenomena—of a perceptive nature—mobilize the complex mechanisms of perception and are dealt with through the prism of psychoacoustics or cognitivist psychology. This category includes both the various phenomena pertaining to the auditory scenes analysis (completion, segregation, omission...) and illusions, ambiguities and other special effects of this kind that solicit the listerner’s perceptive processes. 18Simultaneously, we draw another distinction through the association of phenomena either with singularities or effects. 1) Singularities represent characteristics that are specific to something. We talk about acoustic singularities when the latter only concern the acoustic wave, regardless of its reception, while we talk about auditory singularities when they are related to the perceptive system. 2) As for the effects, they result from concrete experiences and are induced by something. “It is the manifestation of a phenomenon that is inseparable from the existence of an object. In this sense, the effect is not always an object itself.”23 While the boundary between these different aspects may not always be easy to define, every sound phenomenon is generally likely to be analyzed in the light of a four-part categorization, synthesized in the following figure (fig. 2). 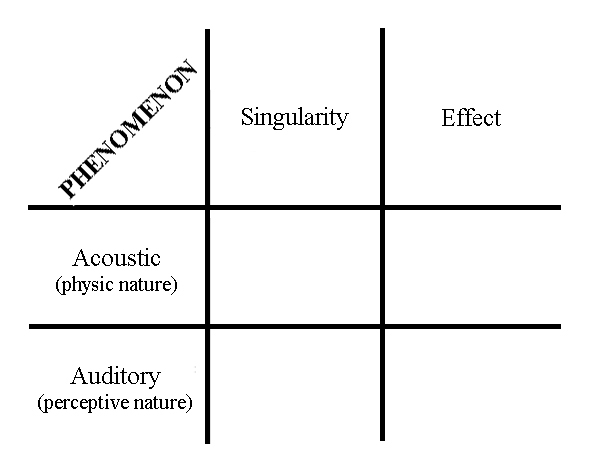 Four-part categorization of sound phenomena. 19Let us return to the example of Mongolian overtone singing. The singer’s filtering is an acoustic effect that allows for the strengthening of the spectral components of the produced sound. These components no longer merge with the other, they are integrated into an auditory stream. The analytical process of auditory scenes represents an auditory singularity in itself and emphasizes the composite nature of the pitch perception. Finally, if the listener does not think that a single person can sing in this way and prefers to believe that this sound comes from various sound sources, not necessarily vocal ones, he/she is then prone to an illusion of a referential kind, which falls within the category of auditory effects. There are indeed other “special” auditory effects, such as paradoxes, ambiguities, perceptions without external stimulus or certain remarkable sensations. These various effects can then be listed depending on the “affected” elements: the sound parameters (pitch, duration, intensity, timbre), “more” musical components (tempo, rhythm, melody, interval...), the sound sources (identity, number), their spatial location (localization, motion). As we prefer to focus on illusion and paradox, two mostly concurrent auditory effects, we cannot further explain this aspect of our typology in this article. 20By nature, illusion tends to deceive the listener in any way and often implies a true misinterpretation, or in other words a discordance between what should be and what is perceived. Computer-assisted sound synthesis offers full control over sound and allows for the creation of truly remarkable illusions of infinity, comparable to the famous endless staircase designed in 1958 by Lionel Penrose and his son Roger Penrose24 (fig. 3). 21In 1964, Shepard synthesizes a series of twelve sounds (consisting only of octave-separated components). Once set in a loop, they constitute an endless chromatic scale that seems to constantly ascend in pitch (or descend depending on the direction of the notes).26 In 1968, Risset performs an endless glissando by carefully proportioning the spectral envelope, so that the central components are strengthened, while the low and high components are gradually introduced or eliminated.27 This glissando is featured in his work Computer Suite for Little Boy (1968), the second movement of which entitled “Fall” symbolizes the dropping of atomic bomb Little Boy on Hiroshima by pilot Eatherly and the latter’s subsequent collapse. During the first part of this extract (fig. 4), up until the 70th second approximately, the drop is suggested by both an endless glissando going slowly in the low (intertwining of hyperbolic curves in the 0-1.000 Hz area) and a dozen of fast and isolated glissandi (almost vertically descending lines). In the second part, the slower endless glissando is superimposed on Shepard’s endless chromatic scale, the spectral components of which are mixed up with the lines of the glissando going low yet appear clearly in the form of dots beyond 500 Hz. As stated by Wessel and Risset, there is illusion when the perceived height is assimilated to the physical frequency of the sound : the latter gives the impression that it endlessly descends, which is impossible without the sound going beyond the hearing range.28 However, although we know that pitch depends in fact on two dimensions—pitch class and pitch height—rather than the physical frequency, the effect can still be regarded as an illusion since we are confronted with what Douglas Hofstadter calls a magical loop29: instead of perceiving a cyclic structure that constantly goes back to its starting point, we perceive a linear endlessly motion. Jean-Claude Risset, Computer Suite for Little Boy (2nd movement, mixing in mono), spectrogram (0-6.000 Hz) produced with the Audiosculpt software (Hanning window, 6.000 samples). © CD Jean-Claude Risset, Songs, Passages, Little Boy, Sud, Wergo, WER 2013-50, 1988. 30 Diana Deutsch, “A musical paradox,” Music Perception, vol. 3, no. 3, 1986, p. 275-280. 22On the one hand, the term paradox refers to a thought or opinion that goes against the common view and on the other hand, it designates an antinomy, or in other words a contradiction between two ideas. The tritone paradox discovered and studied by Deutsch is aptly named, as it reflects the variability of perception depending on listeners rather than a misinterpretation. The same tritone, designed according to Shepard’s sound principle, is prone to contradictory interpretations. It seems ascending to some listeners and descending to others.30 By separately controlling pitch class and pitch height, Risset has managed to produce another kind of paradox: a pitch that simultaneously ascends and descends, the paradoxical nature of which makes it a particularly unusual effect. In the third movement of Computer Suite for Little Boy (1968) entitled “Contre-Apothéose,” the composer uses an ascending glissando that paradoxically ends up lower-pitched than it started. In Mutations (1969), he reverses the process (fig. 5). Once an essentially low-pitched endless ascending glissando performed (320-382 s), he extends it to the whole spectrum (382-450 s). At this moment, the endless glissando turns into a paradoxical glissando: the spectrogram clearly shows that the pitch class keeps on “ascending” (the spectral components still draw ascending lines), while the pitch height simultaneously “descends” (the energy is shifted to the low spectral components). As a result, the tone ascends in pitch; yet, at the end, it is lower than at the beginning. Jean-Claude Risset, Mutations (5 min 20 s – 7 min 40 s, mixing in mono), spectrogram (0-6.000 Hz) produced with the Audiosculpt software (Hanning window, 6.000 samples). © CD Jean-Claude Risset, Sud, Dialogues, Inharmonique, Mutations, Ina-GRM, INAC 1003, 1987. 23Since the second half of the 20th century, auditory illusions have become a favored field of study for several researchers. This term is also found in the writings of composers or musicologists. However, the use of this term is not always justified, since it sometimes refers to strange sound phenomena which, as unusual as they may be, do not necessarily fall within the category of illusions. By definition, the illusion refers to the misinterpretation of an objective reality, although it is not easy to define objectivity, as we have already pointed out. Confronted with this fact, we have tried to establish a relatively open typology that allows for the classification and explanation of a wide array of sound phenomena that may be deemed unusual. These sound phenomena include auditory effects and gather illusions and paradoxes, as well as perceptions without external stimulus, ambiguities and potentially other particular sensations. 2 François-Xavier Féron, Des illusions auditives aux singularités du son et de la perception : l’impact de la psychoacoustique et des nouvelles technologies sur la création musicale au xxe siècle, doctoral thesis [unpublished], Université Paris-Sorbonne-Paris 4, 12 June 2006. 3 George A. Miller and Joseph C. R. Licklider, “The intelligibility of interrupted speech,” Journal of the Acoustical Society of America, no. 22, 1950, p. 167-173. 4 Richard M. Warren and Roslyn P. Warren, “Auditory Illusions and Confusions,” Scientific American, vol. 223, no. 6, December 1970, p. 30-36. 5 To learn more on Warren’s researches and listen to sound samples, please refer to: Richard M. Warren, Auditory Perception: An Analysis and Synthesis (3rd edition), New York, Cambridge University Press, 2008. Auditory Perception Laboratory (University of Wisconsin). [Online] http://www4.uwm.edu/APL/demonstrations.html [accessed 22 July 2015]. 6 Jean-Claude Risset, “Composer le son : expériences avec l’ordinateur, 1964-1989,” Contrechamps, no. 11, “Musiques électroniques,” 1990, p. 112. 8 Diana Deutsch, Musical Illusions and Paradoxes [CD], Philomel Records, 001, 1995. Diana Deutsch, Phantom Words and Other Curiosities [CD], Philomel Records, 002, 2003. To learn more on Diana Deutsch’s researches and listen to sound samples, see: Diana Deutsch (ed. ), The Psychology of Music (3rd edition), San Diego, Academic Press, 2013. Diana Deutsch (University of California). [Online] http://deutsch.ucsd.edu/psychology/pages.php?i=201 [accessed 22 July 2015]. 9 To learn more on Albert Bregman’s researches and listen to sound samples, see: Albert S. Bregman, Auditory Scene Analysis. The Perceptual Organization of Sound, Cambridge, A Bradford Book/MIT Press, 1990. Auditory Research Laboratory (McGill University). [Online] http://webpages.mcgill.ca/staff/Group2/abregm1/web/ [accessed 22 July 2015]. 10 David L. Wessel and Jean-Claude Risset, “Les illusions auditives,” in Claude Malric (ed. ), Musique et ordinateur [Encyclopaedia Universalis, Encyclopaedia Universalis, 1979, p. 161-171. ], Les Ulis, Centre expérimental du spectacle, 1983, p. 93-105. 11 David L. Wessel and Jean-Claude Risset, “Les illusions auditives,” in Claude Malric (ed. ), Musique et ordinateur, [Encyclopaedia Universalis, Encyclopaedia Universalis, 1979, p. 161-171. ], Les Ulis, Centre expérimental du spectacle, 1983, p. 94. 12 Steve McAdams, “L’utopie d’une psychoacoustique musicale,” Les Cahiers de l’IRCAM – Recherche et Musique, no. 4, “Utopies,” Paris, IRCAM-Centre Pompidou, 1993, p. 155-156. 13 David L. Wessel and Jean-Claude Risset, “Les illusions auditives,” in Claude Malric (ed. ), Musique et ordinateur, [Encyclopaedia Universalis, Encyclopaedia Universalis, 1979, p. 161-171. ], Les Ulis, Centre expérimental du spectacle, 1983, p. 94. 14 Jean-Claude Risset, “Illusions sonores et musicales,” Composer le son. Repères d’une exploration du monde sonore numérique, Écrits [“Les illusions musicales,” Pour la science, hors-série, no. 39, “Les illusions des sens,” 2003, p. 66-73], Paris, Hermann, 2014, vol. 1, p. 182. 15 Jean-Claude Risset, “Illusions sonores et musicales,” Composer le son. Repères d’une exploration du monde sonore numérique, Écrits [“Les illusions musicales,” Pour la science, hors-série, no. 39, “Les illusions des sens,” 2003, p. 66-73], Paris, Hermann, 2014, vol. 1, p. 183. 16 David L. Wessel and Jean-Claude Risset, “Les illusions auditives,” in Claude Malric (ed. ), Musique et ordinateur [Encyclopaedia Universalis, Encyclopaedia Universalis, 1979, p. 161-171. ], Les Ulis, Centre expérimental du spectacle, 1983, p. 93-105. 18 Jean-Claude Risset, “Illusions sonores et musicales,” Composer le son. Repères d’une exploration du monde sonore numérique, Écrits [“Les illusions musicales,” Pour la science, hors-série, no. 39, “Les illusions des sens,” 2003, p. 66-73], Paris, Hermann, 2014, vol. 1, p. 181-192. 21 CD edited by Hugo Zemp, Les Voix du monde. Une anthologie des expressions vocales, Le chant du monde, CMX 374 1010.12, 1996. 22 Jens Blauert, Spatial Hearing. The Psychophysics of Human Sound Localization [Räumliches Hören, Stuttgart, S. Hirzel Verlag, 1974], translated from German by John Allen, Cambridge, MIT Press, revised ed., 1983, 1997, p. 2. 23 Jean-François Augoyard and Henry Torgue, À l’écoute de l’environnement. Répertoire des effets sonores, Marseille, Parenthèses, 1995, p. 10. 24 Lionel S. Penrose and Roger Penrose, “Impossible object, a special type of visual illusion,” British Journal of Psychology, no. 49, 1958, p. 31-33. 25 François-Xavier Féron, “L’art du trompe-l’oreille rythmique,” Intermédialités – Histoire et théorie des arts, des lettres et des techniques, no. 16, “Rythmer/Rhythmize,” 2010, p. 145-165. [Online] http://www.erudit.org/revue/im/2010/v/n16/1001960ar.pdf [accessed 22 July 2015]. 26 Roger N. Shepard, “Circularity in judgements of relative pitch,” Journal of the Acoustical Society of America, vol. 36, no. 12, December 1964, p. 2345-2353. 27 Jean-Claude Risset, “Paradoxes de hauteur,” IRCAM Research reports, no. 10, Paris, IRCAM-Centre Pompidou, 1978. 28 David L. Wessel and Jean-Claude Risset, “Les illusions auditives,” in Claude Malric (ed. ), Musique et ordinateur [Encyclopaedia Universalis, Encyclopaedia Universalis, 1979, p. 161-171. ], Les Ulis, Centre expérimental du spectacle, 1983, p. 100. 29 Douglas R. Hofstadter, Gödel, Escher, Bach. Les brins d’une guirlande éternelle [An Eternal Golden Braid, New York, Basic Book, 1979], translated from English by Jacqueline Henry and Robert French, Paris, Dunod, 2000. 31 Luigi Russolo, L’Art des bruits , edition established and presented by Giovanni Lista, Lausanne, L’Âge d’Homme, 2001, p. 105. François-Xavier Féron holds a Master’s degree (Paris 4 University) in musical acoustics and a PhD in musicology (University of Paris IV). Defended in 2006, his PhD thesis focuses on the impact auditory illusions have had on the field of musical creation. A former teacher at the University of Nantes (2006-2007), he became a postdoctoral researcher in psychoacoustics at the Centre for Interdisciplinary Research in Music Media and Technology – CIRMMT (Montreal, 2008-2009), then in musicology at the Institut de recherche et coordination acoustique/musique – IRCAM (Paris, 2009-2013). Since 2013 he has been a CNRS research associate affiliated to the Laboratoire bordelais de recherche en informatique. His research focuses on contemporary music and the interactions between art, science and technology.